Both of my children have been in cloth since birth, and now that the oldest is, at three, only diapered at night, I feel qualified to share my hard earned diapering wisdom. Using cloth has been (and continues to be) great for us. We've spent very little money, and have been using many of the same supplies for three years now, with good results. Good quality diapers and covers make all of the difference in the world, so please don't give up because the chintzy cheap diapers from Target aren't working for you. That said, I always check into a used source before laying down my money for something new. We use a mix of prefolds, contours and fitted diapers. The prefolds are great for absorbencey, the contours fit well inside of velcro covers, and the fitteds are the best at holding in runaway poop. Our covers are also pretty mixed: we have a few Bumkins nylon covers, several Nikky and Biobottom covers in cotton and wool, a few Diaperap vinyl/cotton covers, several pairs of nylon snap pants by Alexis, one Aristocrat wool soaker, two made-from-a-sweater wool soakers, one wool soaker from Babyworld in New Zealand, and two prized wool Bumpy covers by Imse Vimse. We also have a few all in one diapers (diapers with waterproofing built in), by Bumkin (great), Kushie/Kooshie (okay), ReUzem (not too bad), and Cottontail (awful). Almost all of my covers I have bought used, from local or online thrift and consignment shops, and most of my diapers have come from online auctions. I personally am no good at pinning, although we do keep a few pins around just for the sake of trying. I also have a Snappi diaper fastener, and am sometimes able to get it to work. Mostly, we just stuff prefolds into covers, or use the contoured diapers. After poor results with the Rainbow contours by Natural Baby, we use some nice, thick ones that I found at the Mother's Nature Auction (unknown brand). When buying prefold diapers, you will want to look for DSQ (diaper service quality) diapers, otherwise the absorbency just isn't there. We were gifted some prefolds that would make good dinner napkins... but that's about it. Finally, a word about washing. We did a lot of experimenting before settling on Dr. Bronner's as our diaper soap of choice. I like to use either the peppermint or the lavender, about a quarter cup for a large load. 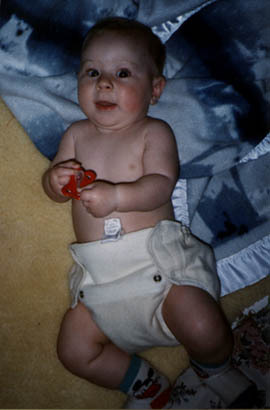 For babies who are exclusively breastfed (as our younger still is), we toss poopy diapers right into the pail. With solids, just shaking them into the toilet will usually suffice, or dunking by one corner of the diaper. Sticking your hands down into the toilet and wringing out the diaper is totally unnecessary and, personally, about the most disgusting thing I've ever heard! But back to my washing routine: Every second or third day, we take the nylon pail liner ($4 at Kmart), dump it into the washing machine and give it a rinse cycle. Then a cold soak for a few hours, followed by a hot wash with soap, and then a second rinse for good measure. I sometimes add a little vinegar to the second rinse, as an antibacterial measure. We wash the covers with our clothes, usually in TideFree, and hang them to dry regardless of their instructions, to prolong their lives. Before putting diapers or covers in the dryer, I also look through and check for stains - any stained stuff gets hung out in the sun, an age old method that has worked for me, every time. Washing soakers is a bit more involved, but only needs to be done every so often - whenever your soaker smells. I sometimes use Eucalan wool wash, or a mix of Dr. Bronner's and lanolin if I'm all out. They key is to wash without rinsing, and allow for two days or so to let the soaker dry all the way through. Thank you if you have actually read this far! Here's hoping that you find something useful in my experience. People often seem intimidated by cloth diapering, but I take a fearless approach. Just dive in, and if you buy something and find that it doesn't really work for you, you can always sell it at an online auction - which is more tha can be said for disposables! Happy diapering to all and to all a good night. there about a zillion good reasons to use cloth diapers; my main reason is because I LIKE them better! give it a try, maybe you will, too. here are some resources for buying diapers for your babe. I have found good stuff from all of these sources, and also from thrift stores and consignment shops all over the southeastern US. Choosey Diapers great prices on Alexis pants and Zippidy diapers - lotsa other stuff, too!